Much of the jewelry that I am invited to create has significant importance as birthday gifts, anniversary presents, or engagement and wedding rings, but on occasion I am invited to create a piece of jewelry that tells a more complete story of the couple’s past, present, and future as their family grows and evolves. I have been asked to create a very special pendant for a couple that is expecting their first child. This is an amazingly powerful time for any couple, but these new parents have also learned that this will be their only chance at having a baby, which makes this piece of jewelry all that much more meaningful. In our early conversations that focused on design possibilities the thing that kept coming up was the couple’s love of the Victorian era. 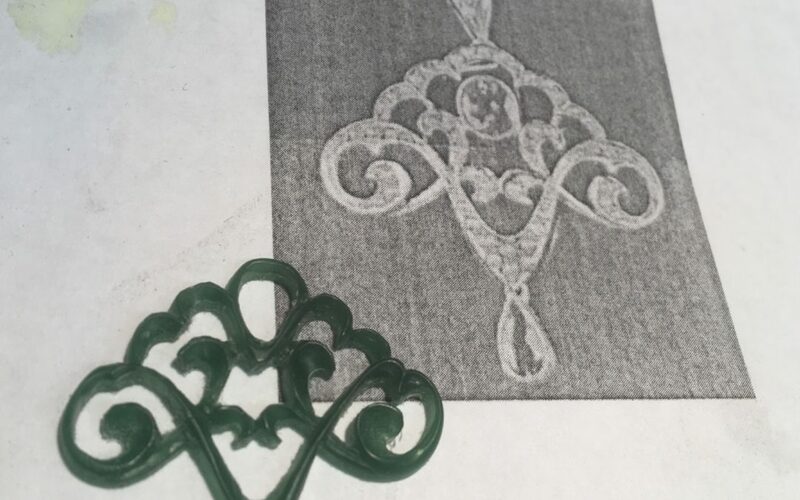 What evolved is derived from a pendant design that I found in a museum’s collection from the 1880’s. Cast in 14kt rose gold with a rose gold chain, the pendant will hold a silver gray moonstone, which is the baby’s birthstone.